Enjoy Island Living with your family or friends in this three bedroom, two bath cottage overlooking Decker Cove. Walk to nearby Robinson's Wharf for lunch or dinner or to buy fresh lobster from our local lobstermen to cook at your cottage. Comfortably furnished with an eye to family living. FREE WIFI and Air Conditioning are included at this cottage. 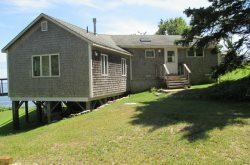 Cozy Cottage is designed for family living with both a family room housing the TV and games, a combination living/dining room with views of the water and a newly remodeled kitchen as well as a laundry area and shower bath. Upstairs are three bedrooms - 1 King, 1 bedroom with stacked bunk beds (Twin size), and the third bedroom containing two Twin beds. There is also a second bath with a tub/shower combination on this level. Enclosed porch entry for sitting with morning coffee and enjoying watching the sunrise. PETS PERMITTED? No, pets are not allowed at this property due to the owner's severe allergies. LINENS INCLUDED? Yes, linens and towels are provided for your stay at no additional cost. Southport Island's Hendrick's Head Beach is about 2 miles from the cottage and affords views of Hendrick's Head Lighthouse, now privately owned. This is a great beach to launch a kayak and explore the island and a great way to visit the smaller islands nearby. Cuckold's Lighthouse, off the tip, is also privately owned, but still maintained by the Coast Guard, open to the public and has become an inn. Don't forget a stop at Southport General Store for their breakfast pizza, sandwiches or regular pizzas and smaller grocery items. Pets - No, pets are not allowed at this property due to the owner's severe allergies. A 4-NIGHT MINIMUM IS REQUIRED FOR NON-PEAK SEASON RENTALS. We require at least 72 hours notice of intent to rent so the cottage can be prepared for your stay. Swimming Area Rating 0/5: Not a waterfront property. *Hendrick's Head Lighthouse & Beach within 2 miles gets a 5/5! Bathrooms: (1) shower bathroom with sink & toilet on the main level, and (1) Full bathroom with shower/tub combo, sink & toilet on the second floor.